The cards are inspired by the most important people who made a pilgrimage to Compostela. The 4 sticks that make up the deck (scallops, pumpkins, knives and bordones), symbolize the most representative elements of the pilgrim. They would be the traditional ones (gold, cups, swords and clubs) of the classic deck. 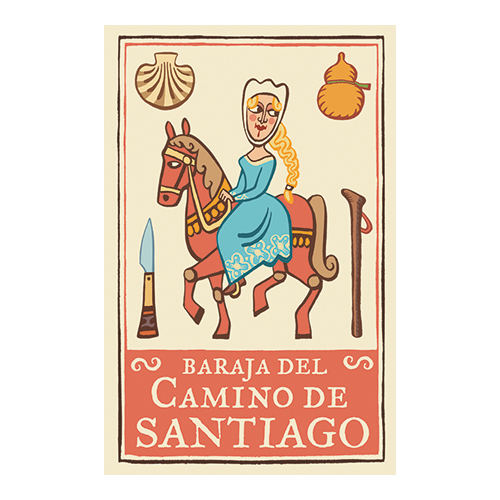 For the figures (sotas, horses and kings and queen) we made a selection of the most important pilgrims and pilgrims who made the Camino de Santiago throughout its history. This Deck is intended as a tribute to those pilgrims and pilgrims who yesterday and today walked to Compostela. A brochure is attached in several languages with the descriptions of the characters and the clubs of the deck (Spanish, English, French, German, Italian and Portuguese).